Mike Bongiorno has passed away. 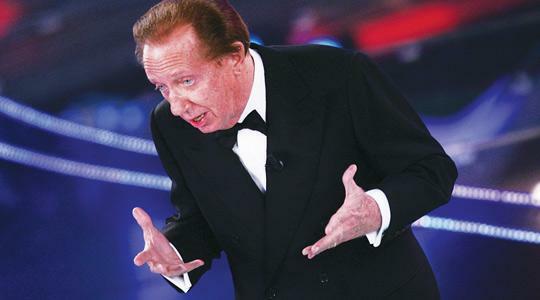 The TV host, born in New York on May 26, 1924, suffered a heart attack around noon while he was in Montecarlo on Tuesday. Nothing could have predicted his death, so much so that the popular television host left just the day before he died from Milan, to spend a short vacation in Montecarlo before diving into a new television adventure, a quiz show on Sky, that would have brought back the lucky series Rischiatutto. So it seems nothing would have deterred the Italian "king of quiz-shows" from carrying on with his timbre of entertainment albeit at a venerable age. In Malta, Mr Bongiorno acquired immediate appreciation since the start of his career on the Italian public broadcaster RAI when it was still transmitting black and white pictures even before MTV, Malta's own public channel, started broadcasting in 1962. As a child I remember joining Italian and Maltese televiewers mostly every Thursday night to follow the Bongiorno style of putting quizzanti with their back to the wall against the ticking clock in popular series such as Rischiatutto and Lascia o Radoppia. The excitement was contagious in its interactive invitation to entice viewers in trying to guess the answer or at least sympathise with one bravu participant against another. Most of the quizzes were live which later on, as a quizmaster myself, I found to be a disciplinary advantage on the master's side. Participants during a live do-or-die situation tend to be more anxious and experience visible stress thus contributing to the further success of a non-missable serata. Mike was not the type of quizmaster with whom you could take it easy - he was demanding almost in an aggressive way trying hard to trip anybody who is not super prepared. In itself that was an art and since he had his Dr No to decide for him on admissable answers he used to excel in his handling of the studio drama. From the beginning, the attraction to participate, did not only lie in the winning of handsome prizes - usually big amounts of money - but also in achieving a bravura in front of the television cameras and therefore in front of the nation. Taking part in Mr Bongiorno's quizzes almost offered a cut above the rest of the programmes. One had to have brains, good memory, personality and courage to face the pressure in the studio. Mr Bongiorno was not only a quizmaster. He pervaded most genres of the TV spettacolo and we find him hosting the San Remo festival in his older age in a mission to bring the Italian international song contest back to its glory days. Moving from RAI to Mediaset he joined Mr Berlusconi in spearheading the television industry into the commercial sphere and create further competition on the airwaves in Italy. The Italian political class, including the President of the Republic, recognised the television personality's role in shaping television entertainment for many decades on the Italian landscape. Most probably without knowing it, Mr Bongiorno could also be credited with the original inspiration behind most of our more successful quiz shows since the 1970s when Television Malta invited me to present the first quiz show for adults as prime entertainment Għal Fuq Xbin? Following the success of this village interquiz marathon TVM regularly included a popular quiz show in each of its autumn schedules for many years. Different heads of programmes at Television House, at least up to the end of the millennium, valued the viewers' attraction to quiz shows and each year I used to delve into my creative corridors to match Mr Bongiorno's shows without ever duplicating RAI's ideas - a formidable challenge in its own right especially when one considers that budgets were never anywhere to match. Many remember his joyful and enthusiastic "Allegria!" served as a sorbet between moments of deep anxiety. Each correct answer meant so much to all the thousands of viewers that during commercial breaks it was customary for me to phone experts - Professor Ġużé Aquilina comes to mind as taking interest in patient quick explanations - to clear some ambiguous meaning or other which participants in their moving responses uttered without enough attention to the rules of the game. Most of the shows were broadcast live and therefore, not unlike a live football match, going back was almost never possible.